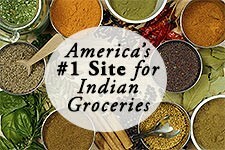 Buy Kitchens of India Spice Curry Pastes like Butter Chicken Paste and Many More! Rich, mildly spiced gravy that recreates the taste of truly mouth-watering Butter Chicken. Just add tender nuggets of chicken. Cook and serve. Specially blended by the master chefs of world-renown ITC Hotels. Ingredients: Tomato Paste, Water, Sunflower Oil, Spices, Onion, Garlic, Gram Flour, Sugar, Salt, Skimmed Milk Powder, Fresh Ginger, Melon Seed, Cashew & Spice Extract (Paprika Oleoresin). 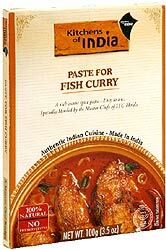 Rich, mildly spiced gravy with handpicked spices added in perfect proportions to recreate truly authentic Fish Curry. Just add fresh pieces of fish and cook. Serve with a dash of lime. Specially blended by the Master Chefs from the world-renown ITC group of hotels. Ingredients: Onion, Garlic, Sunflower Oil, Spices, Tomato Paste, Ginger, Salt, Lime Juice, Water, Curry Leaves & Dehydrated Garlic Flakes. 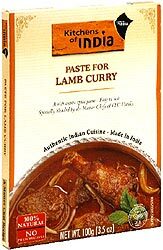 Rich, mildly spiced, aromatic gravy that brings out the taste that is faithful to the original, traditional Lamb / Mutton Curry. Just add chunks of boned lamb and cook and serve. 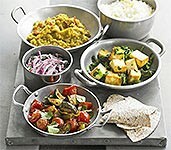 Ingredients: Onion, Garlic, Sunflower Oil, Spices, Tomato Paste, Fresh Ginger, Salt, Water & Lime Juice. 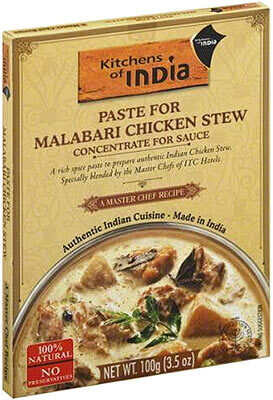 A rich spice paste to prepare authentic Indian Chicken Stew. 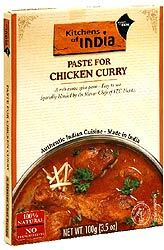 Just mix this paste with water, chicken, potatoes, green peas and carrots and simmer for 20 minutes until cooked. Flavorful chicken stew is ready! 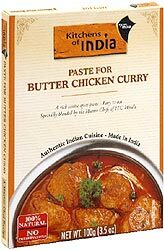 Ingredients of paste: yogurt, onions, coconut milk powder, sunflower oil, white corn flour, salt, spices, ginger, skimmed milk powder, green chilies, milk cream powder, yogurt powder, coriander leaves, curry leaves and sugar. $2.19 Notification will be sent to your e-mail address every time the item price is decreased.